The Tamri Goat, a breed in Morocco masters the art of tree climbing. The goat learn the skill due to the scarcity of flora and food. The goats supposedly love to eat the berries of Argan trees. But those fruits are forbidden due to the height until goats learn how to climb the trees to access the fruit. 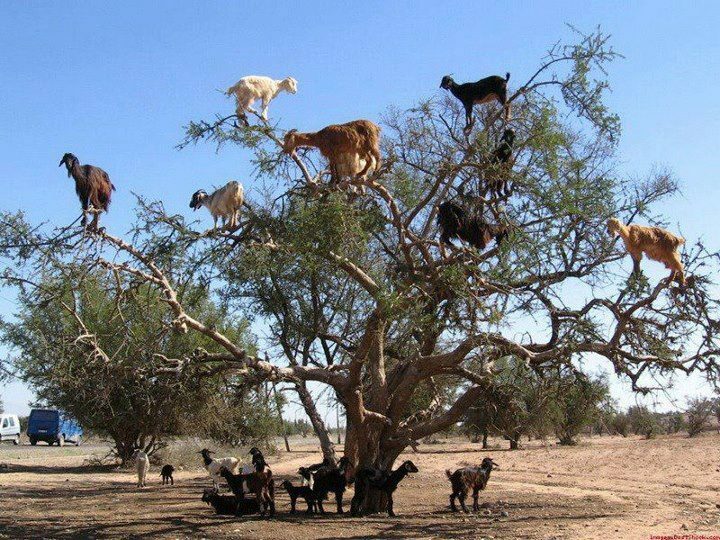 "In Morocco, goats have mastered the art of tree climbing. Since only one in three of today's children have ever climbed a tree, maybe they can learn from the goats!" As we finished our lesson of PARTS OF A PLANT, we were planning for the next relevant lesson of PARTS OF A TREE, so we decided to go out look and observe some trees in the garden. I pointed out the roots, trunk, branches , and the leaves ...parts of a tree and then they bombarded me with lots of amazing questions. One of them shouted, " Can we climb this trunk ?" My answer was ,"Yes ,why not". 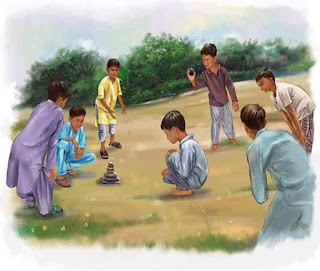 And then the children dived into an Imaginary world , where they existed with their own fantacies...its wonderful to witness their wilderness and curiosity. This child was stuck up first ,but never ever felt bad, rather he came up strongly again and again . The key of Children's curiosity is that the word Failure never existed in their dictionary of life, and we have to learn that lesson from them. The first few steps are the hardest, but then the NEURONS in the brains work amazingly to give a lift to any newly learned activity. Tree climbing has a lot to teach a child about Balance, co-ordination of Gross-motor skills , controlling of Fine-motor skills, eye -hand co-ordination, predictability of height, the perfect Grasping positions, the relation between man and nature (nothing can be taught through lectures and books). Every child learns in his own way, I discovered that each one experienced a unique way to hold the trunk, grasp it with hands or feet, where to Gaze while going up, what to see when coming down, so its all about INDIVIDUAL UNIQUE LEARNING , which cannot be generalized .That's the beauty of nature interaction. The "immense concentration of a child" is the natural outcome when he works in nature , we need not to do anything to build up the span of attention in children or speed up their curiosity or raise their concentration level. Its already there in their SOULS . Stickers (artificial reward systems) never works in reality, it only makes a child greedy. Learning is something which a child does himself in a natural way . The children can never be seen so satisfied as can be seen after reaching their Goals and targets .And it is not we (adults) who can direct them towards their UNIQUE GOALS , its embedded inside them and they are the best judges and leaders of their destiny, if only we think differently . After the climbing session, they all relaxed. At that time, I introduced them the lesson on PARTS OF A TREE through pictures and culture cards. If you look at this picture in a bit detail, you will find out a PIECE OF TRUNK from the tree which one of my children had pulled out from the tree he climbed .He came to me and asked," Miss Erum, can I pull out one of those part ? I want to see if I can pull it ? It was amazing to witness how children CHALLENGE themselves ,they don't need artificial or externally induced Challenges ,they know exactly what to challenge and how to challenge....Speechless! And then the boy asked me that he wanted to put that piece of trunk on our NATURE TABLE . So he took out the Nature tray, put that piece over there , brought it to the Circle area and then announced proudly, "Look at this ". The children shouted ,"wow ,you have pulled out one, how did you do that?" Is'nt it amazing what IMPORATNT AND RELEVANT Questions kids ask . So he got the Magnifying glass and took the Trunk piece to every single child for Observation. And thats not the end of the CURIOSITY JOURNEY , thats the BEGINING infact.